I can't find much information on these beetles, but they look interesting. I caught three yesterday in a rotten log, and I wanted to know if it was possible to breed them. I saw that Lucanus started a thread on these a long time ago, but it looks like he hasn't been on the forum in a while. Anyone know about their care in captivity? I currently have them in the fridge hibernating to give me a bit more time to figure out how to care for them. 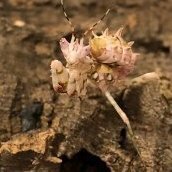 I was able to get adults to oviposit when kept in an enclosure with lots of bark and a moist substrate of crushed, rotten hardwood, but unfortunately I was never able to rear any larvae to adulthood, they all died off one by one. I don't know if it was cannibalism, an improper diet, improper humidity levels, or just an improper setup, (I think they may need to bore into large chunks of wood rather than live in a mix of pre-crushed substrate). The adults lived for about a year, seems like they barely ate grain based foods at all, almost looked like they were gnawing on the bark, perhaps feedings on lichens or mosses? Overall they were not an easy species to keep or breed, I think adults probably have a specific diet of lichens, mosses and fungi in the wild, and larvae probably need to be kept isolated in large, moist pieces of rotten wood, yet they do seem to need access to protein to survive. One of my friends fed an Alobates adult a scarab grub.